2009 Malibu Barbie is the fourth doll in the My Favorite Barbie series, issued in 2009 in honor of Barbie's 50th anniversary. This is a giftset that includes a faithful reproduction of Malibu Barbie wearing her original aqua blue swimsuit, round sunglasses and yellow towel and also includes the mod Barbie ensemble, Lemon Kick #1465 (1970). This is the second reproduction of Malibu Barbie, the first Malibu Barbie Reproduction was done in 2002. Malibu Barbie was chosen to be reproduced for Barbie's 50th anniversary because she is considered to be one of the most important Barbie dolls of the 1970s. She was a instant and huge success. She marked the end of the mod era of Barbie and the beginning of a new direction (in Barbie and in the fashion of the day) of a more relaxed and contemporary style. 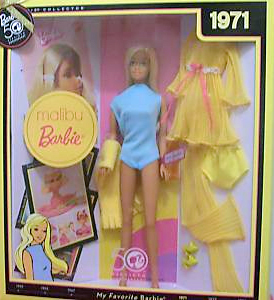 Malibu Barbie was introduced in 1970 and was sold throughout the decade. This is the fourth in the My Favorite Barbie series, a series of six vintage Barbie reproductions to celebrate Barbie's 50th. It was released in January 2009 with a retail price tag of $39.95.